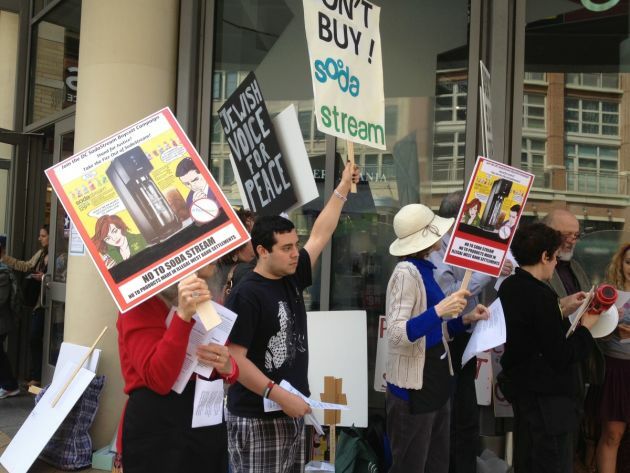 (Photo: Ecumenical News / Dawn Cherie Araujo)Protests meet outside the DC USA shopping complex to promote a boycott of SodaStream products, some of which are made in the Occupied Palestinian Territories. The group of protestors organized by Jewish Voice for Peace in the Washington DC Mall is small, but their goal is clear: they want Americans to boycott goods made by foreign and Israeli companies operating in the occupied West Bank. Sunday afternoon, about 10 people met outside the DC USA shopping complex in Columbia Heights neighborhood to protest SodaStream, the maker of a popular carbonated beverage maker. The protestors, organized by Jewish Voice for Peace, asked passers-by to boycott the company's products because one of its seven global manufacturing plants is located in an Israeli West Bank settlement. The group meets monthly outside the DC USA complex to protest, and it has garnered strong interfaith support. The Washington Interfaith Alliance for Middle East Peace endorses it, and a fair proportion of the protestors are Christian. Liana Smith, a teacher who used to work for the ecumenical Middle East Council of Churches, is a regular participant and said the protest is generally well received by the public. "A lot of people stop and talk and want information," she said. Smith said the protestors chose the shopping complex because it houses four stores that carry SodaStream products – Target; Best Buy; Bed, Bath & Beyond and Staples. Paul Verduin, a member of the Israel/Palestine Mission Network of the Presbyterian Church (U.S.A.) said he joins the monthly protest because his faith requires it of him. "We are asked in our Bible to do justice, love kindness and walk humbly with God," he said. " And Jesus proclaimed justice to the oppressed, freedom to the captives. The Palestinian people ... have languished under occupation now for 46 years. They don't have their basic civil rights." At its general assembly last July, the PC (U.S.A.) voted to boycott "all products coming from the occupied Palestinian territories." Two months before the Presbyterian vote, the United Methodist Church also voted to boycott products manufactured in the West Bank, although it rejected proposals to divest from companies whose products contribute to the Israeli occupation of the West Bank. The UMC and the PC (U.S.A.) have been both praised and strongly criticized for their positions on the Israeli settlements. Yet Carolyn Karcher, a member of Jewish Voice for Peace, said the criticism is unfair. "The argument is so often used, if you're doing this, you're being anti-Semitic," she said. "So we feel it's important to show that this is not anti-Semitic, this is a human rights issue. "And you're trivializing actual anti-Semitism by politicizing it and accusing people who criticize Israel rightly on good political ground for being anti-Semitic." The Israeli military took over the majority-Arab West Bank in 1967during the Six-day War pitting Israel against its neighboring countries. Israel began building neighborhoods, in violation of international law. Today, nearly 500,000 Israelis live in West Bank settlements, which has resulted in decades of violence perpetrated by both Israelis and Palestinians.